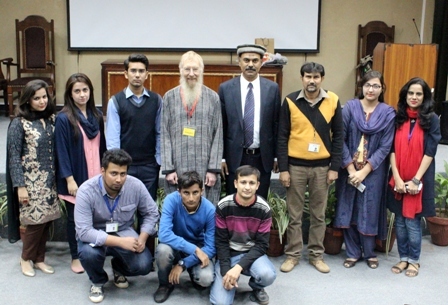 Undergraduate Mathematics Society in collaboration with National Mathematics Society of Pakistan organized a lecture by Prof Michel Waldschimdt on 26 November 2015. 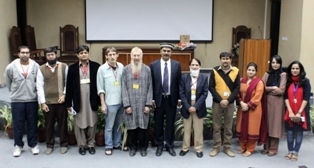 National Mathematics Society of Pakistan has launched a new program known as Eminent Professors Lectures Program (EPLP) and Forman Cristian College (A Chartered University) was chosen for its very first lecture. 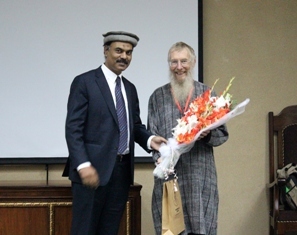 Prof Waldschimdt is a renowned French mathematician and an expert in number theory. He has been the president of the Mathematical Society of France from 2001 to 2004 and vice president of CIMPA, Centre International de Mathematiques Pures et Appliquees (International Center for Pure and Applied Mathematics; Nice, France) from 2005 to 2009. The title of his talk was “Some arithmetic problems raised by cows, rabbits and the Da Vinci code”. The lecture was attended by quite a good number of people including the instructors from various department of the university. The lecture would surely help the people better understand the world by providing the better understanding of numbers in particular and mathematics in general.